Once you have created a page or post in NUsites, you can use multiple methods to add media like videos and pictures. To embed a downloadable file into a post or page, click the Add Media button. At this point, you may choose to Upload Files or select a file from the Media Library. 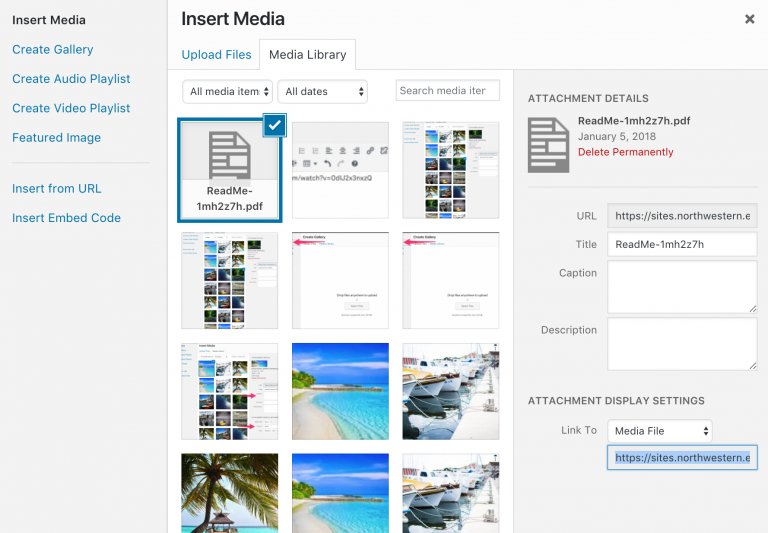 In the Insert Media popup, you may drag and drop an image, or click Select Files to locate a file on your device for upload. Once you’ve uploaded a file, you will be able to make adjustments to the file. Under Attachment Display Settings you can adjust what will happen when users click on the download link. Link To – Set a destination URL if a user clicks on the image. By default this is set to Media File and clicking will download the file. The downloadable file will appear as a link in your content. NUsites will automatically translate the link and embed the content on your page or post. Make sure the URL is on its own line and not hyperlinked (clickable when viewing the post). If you wish to insert videos into your pages or posts, we recommend you upload to a video platform such as YouTube or Vimeo. WordPress will automatically convert a YouTube or Vimeo URL to an embedded iFrame. The video will automatically appear when you save the page. 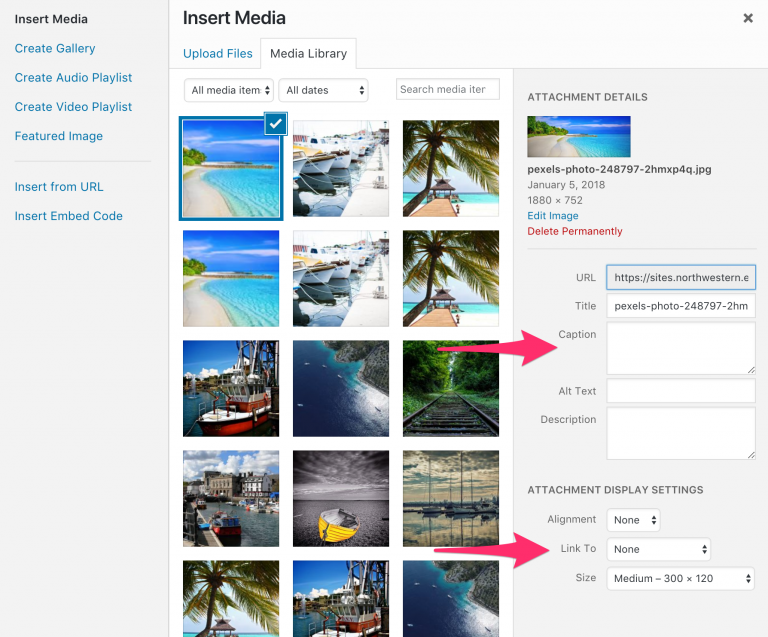 To embed an image gallery into a post or page, click the Add Media button. At this point, you may choose to Upload Files or select images from the Media Library. To embed an image into a post or page, click the “Add Media” button. At this point, you may choose to Upload Files or select an image from the Media Library. In the “Insert Media” popup, you may drag and drop an image, or click “Select Files” to locate a file on your device for upload. 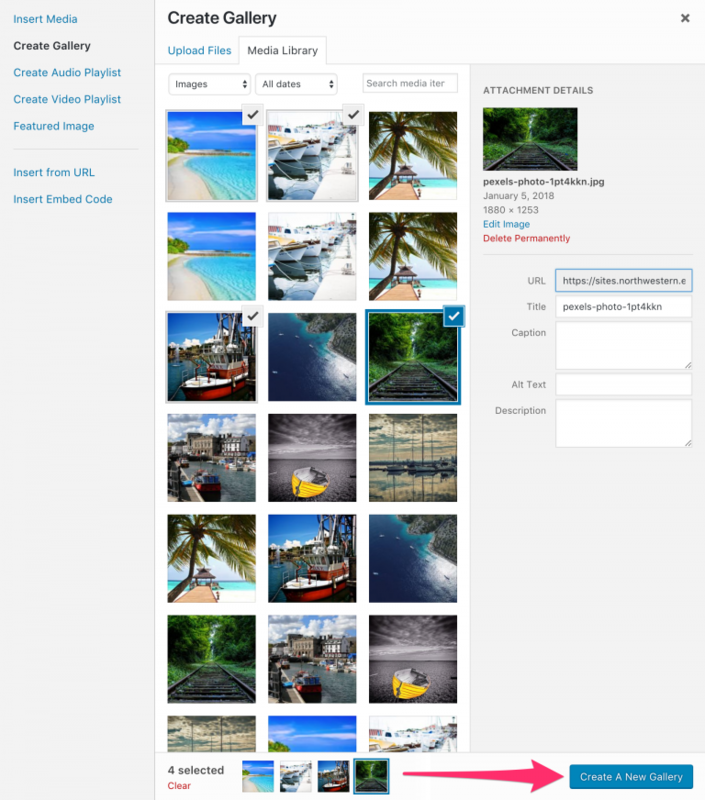 Once you’ve uploaded an image, you will be able to make adjustments to how the image displays. Link To – Set a destination URL if a user clicks on the image. Size – How large should this image appear. At this point, you may click to select an image to insert into your page or post.